A poignant, timely, and universal picture book about fear, adoption, family, and the joy of fatherhood, written by beloved and award-winning author Vera B. Williams and illustrated by the author in collaboration with two-time Caldecott Medalist Chris Raschka. After Lester is adopted by Daddy Albert and Daddy Rich, he develops a big problem—he can't fall asleep. Night after night he creeps into his parents' room and attempts to crawl in between his two daddies, confident that if he's with them and their dog, Wincka, nothing bad will happen to him ever again. But every night, Lester's new dads walk him back to his own room, hoping that eventually Lester will get used to the new house and his new family and feel as though he belongs. They buy him a bike and take him for ice cream. They make cocoa and introduce him to his cousins. But no matter how happy Lester seems during the day, he still gets scared and worried at night! It's the sweet dog Wincka who finally solves the problem when she climbs into Lester's bed and promptly falls asleep, serving as both his pillow and his protector. Lester feels home at last. Vera B. Williams died on October 16, 2015, while still working on this book with her dear friend and fellow artist Chris Raschka. Chris Raschka's astonishing and glorious full-color paintings are based on sketches by Vera B. Williams and honor both her spirit and her intent. 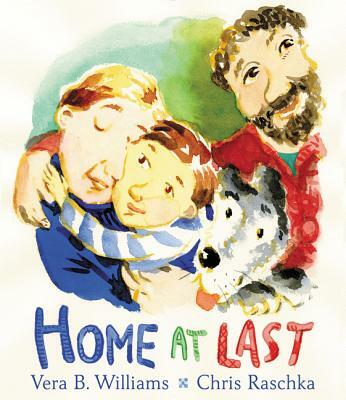 Home at Last is a universal, timely, and timeless book about the right of all children to belong someplace safe. Vera B. Williams began her career in children’s books by illustrating Hooray for Me!, written by Remy Charlip with Lilian Moore. Her beloved A Chair for My Mother won multiple awards, including a Caldecott Honor, and “More, More, More,” Said the Baby also received a Caldecott Honor. Vera B. Williams was the recipient of the Jane Addams Children’s Book Award; she was awarded the 2009 NSK Neustadt Prize for Children’s Literature; and she was the US nominee for the Hans Christian Andersen Award in 2004. Vera B. Williams died on October 16, 2015, shortly before this book was completed. Chris Raschka is the creator of many distinguished and award-winning books for children. He has received two Caldecott Medals: for The Hello, Goodbye Window, by Norton Juster, and for his own A Ball for Daisy. He also received a Caldecott Honor for Yo! Yes? Chris Raschka was the US nominee for the Hans Christian Andersen Award in 2012 and 2016 and has been awarded a New York Times Best Illustrated Book citation five times. He lives in New York City with his family.